Triads may be at the core of all common chords, but they are hardly the end of the story. One common variation is to expand them by building up by thirds. You will remember that a standard triad consists of three notes—a root, a third (which is a third higher than the tonic), and a fifth (which is a third higher than the third). It is possible to keep on going by adding more thirds. Each time we do this it makes the chord more complicated, but the core triad can still be heard. Let's see how this works. 1 In earlier use, it was simply a passing tone such as 5-4-3 with the 5 being part of a dominant chord and the 3 being a component in the tonic. The movement through the 4 created further instability with the 4 of the scale implying the 7 of the dominant chord, with its mild dissonance. 2 The instability of the dominant seventh is also partly a result of its own internal dissonance. The minor seventh interval (between its root and seventh) is dissonant (much more so when played without the other notes), and the tritone between its third and seventh steps is also unstable. The leading tone(s) simply direct where this discomfort wants to take us in order to find resolution. The leading function is the not only use of the dominant seventh in music. Blues, in particular, often uses it for the root, at least partly because blues tends to prefer a modified mixolydian mode. 3 Voicing is something we will talk about later, but it refers to the exact notes used rather than just the note classes. In this case, a C7 might be voiced with a c4 and a b4, but not generally with a c4 and a b3 (see Pitch, notes, and scales). Just as with other triads, dominant seventh chords can be inverted, even with the seventh in the bass (called the third inversion), although that is the least stable sounding. While the dominant seventh adds a minor third above the fifth. It is obviously possible to add a major seventh instead, in which case it is called a major seventh chord. Within the major scale, that is the natural seventh for the tonic and subdominant chords. Major sevenths are frequently used in more easy-listening jazz and folk music, but obviously can be used whenever the composer wants that sound. Major sevenths contain a strong dissonance between the seventh and the tonic notes, since they are only a half-step apart. Consequently, they are generally voiced3 with those notes separated by at least the interval of a major seventh, which gives it a smoother sound. If a chord is simply named X seven or X seventh (e.g. C7) it is referring to the dominant seventh. If a major seventh is intended, that is stated explicitly (e.g. G7). 4 Of course, the seventh of the chord is still the subdominant in the scale, but since the tonic's third is minor, the urgency to resolve is no longer present. Also, the dissonance of the tritone between the third and the seventh, present in major dominant seventh, is missing in the minor seventh. 5 As discussed in the jazz charts section, some musicians prefer uppercase delta symbol—or triangle, if you prefer— "∆" instead of "" when used as a chord component. Using this approach a minor-major seventh would be written Xm∆7. In this case, I think I agree, although I will stick to the way I have been doing it for the sake of continuity. 6 In fact the 3-5-7 of the diminished seventh taken together make a minor chord built on the second scale step. 7 'Leading chord' is not a standard musical term, although perhaps it should be. By it I mean a chord that, like a leading tone, generally makes the listener want to hear it resolve to something, most frequently the tonic. The Gm7 chord on the staff. Minor chords can also accept sevenths, not surprisingly, although minor sevenths (Xm7) do not have the urgency associated with the dominant seventh. They lack the leading tone, and when they occur as the dominant chord in a minor key, they lack the secondary leading tone in the fourth as well.4 This is one of the reasons some composers like the harmonic minor scale—its urgency to resolve is strengthened by the fact that it is a temporary move out of the natural key as well. 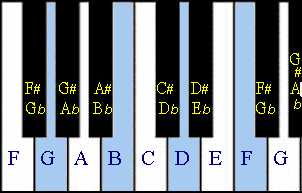 Nevertheless, the minor seventh is an attractive chord, and is also a frequent component in light-jazz influenced music and blues. 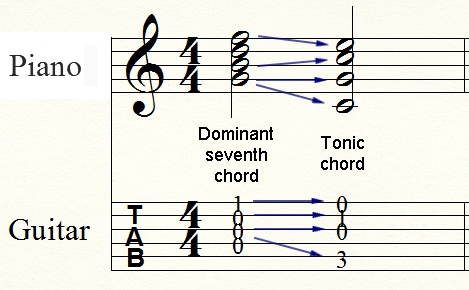 Strictly within a diatonic scale, major chords can accept either major or minor sevenths (yielding X7 or X7 chords. However, minor chords only appear with minor sevenths (yielding Xm7 chords). Minor-major seventh (Xm75—e.g. with minor thirds and major sevenths) are possible, but are not as attractive to the ear, both because of the half-step dissonance, and because they do not have a place in the diatonic scheme of things. Diminished chords often serve the same functional purpose as dominant sevenths. This is not so surprising; if you look back at the dominant seventh chord and remove its tonic note, what do you get? A diminished chord. It has its root on the leading tone and its fifth on the secondary leading tone, and the removal of the dominant note (of the scale) actually makes it even more unstable. Of course, you can also add sevenths to these chords. In the diatonic scheme of things, that would be a minor seventh. Oddly, that undercuts some of its internal dissonance. By itself, the triad exposes the tritone as the most prominent interval; once you add the minor seventh it contains a perfect fifth between the third and the seventh of the chord.6 It is still a nice chord, but if you were looking for that instability, you will be left wanting. The solution is to drop the seventh down another half-step from a minor to a diminished seventh. At this point you are out of any pure diatonic key, but now your chord wants to go somewhere—anywhere. That 'anywhere' feature is going to come in handy later, but for now you are back to having a leading chord.7 If you go this route you now have a chord with two diminished fifths in it—between the root and the fifth, and between the third and the seventh. Since it is best described as a diminished chord with a diminished seventh, it is sometimes called a doubly-diminished chord (written X7). Using this terminology, the diminished chord with the minor seventh is simply called a diminished seven (X7). Two kinds of diminished chords, and two approaches to naming them. Just when you think this is all making sense, you find out that another group of music theorists have noted that the diminished with the minor seventh is much more rarely used. They argue that the term 'diminished seven' (X7) should refer to the most common form—the one with the diminished seventh as well as the diminished fifth (they will sometimes call this fully-diminished). In order to have a name for the other, they call it a half-diminished seventh (X7). I don't care which one of these two methods you find more convincing, but because I don't know who is reading my chord chart, I tend to skip the middle (and the ambiguity), calling them doubly-dimisished and half-diminished (X7 & X7), respectively. In the real world of charts, almost nobody writes the seven anyway; they just assume you will play the fully/doubly diminished seventh version and simply write it as X. You will see regular diminished triads (i.e., without the added seventh) in scored music, but I have never seen one in a chord chart (I will probably get mail with 15 examples). Augmented chords only occasionally attract sevenths, but it happens. 8 Sixth chords are redundant, though, as I will point out below. You can certainly add non-triadic notes to your chords other than the dominant seventh, but how you name them gets us into a little controversy. The method I prefer uses the numbers above 8 to indicate the type of piled on expansions that we will talk about next (X9, X11, X13). Numbers below 8 are simply add-ons to the triad. We have already seen X7. Similarly, X2 is a triad with the major 2 note added; X4 is the triad plus the fourth; X6 is triad + the sixth from its scale. Any of these chords can have major or minor thirds. The six chords may need you to specify whether you want a major or minor sixth added.8 Normally, I assume that a major chord takes a major 6 and a minor chord takes a minor 6; if you intend otherwise you should specify (see the chart at the end). Minor seconds are rare so you would need to be explicit if that is what you want (X(m2) or X(♭2)-notice that Xm2 would mean a minor chord with the major 2 added, so you need the parentheses to avoid misunderstanding). If you want an added tritone rather than a perfect 4, you would specify the same way. Suspensions with and without sevenths. C2 and C4 present something of an issue because some people use those titles in different ways, which can cause confusion. There is a type of chord called a suspension that we will understand better when we talk about melodic movement, but in popular charts the term refers to the relocation of the third up or down a step. 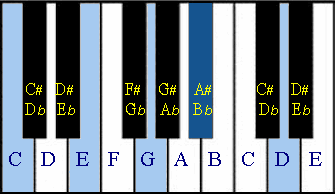 A chord is said to have a suspended four (X) if the third is replaced with the fourth note in its scale. Conversely, if the third is replaced with the second scale step the chord is called a suspended two (X). As the illustration shows, they can also be expanded with added sevenths (usually minor). You will often see the X as just X which is common enough that it is unambiguous. However, you will also see some cases where someone just writes X4 or X2, respectively, for the suspensions. I am not sure what the logic behind this is, but it creates enough ambiguity that some people will use the terminology X11 or X9 when they simply want to add a note to the triad. I do not prefer this usage, but you should be aware of what you are looking at if you see it. 9 The redundancy also happens even when you mix the major/minor on thirds and sixths. Cm∆6=A7 and C(m6) = A♭∆7. In fact, some charts prefer m6 (assuming the 6 is major) as a way of writing half-diminished chords, on the assumption that it is less confusing. Six chords and their alter-egos. This is not to discourage you from using six chords. If that is the collection of notes you want, performers in general can make sense out of it just fine, often more quickly than they can calculate how to play the inversion. You should, nevertheless, know what it is that you are doing. There is not much point in asking your band to play C6 in third inversion (six in the bass); just say Am7. Beginning in the 19th c., but becoming quite prominent in the 20th and later (particularly in jazz and blues), we see (hear?) a group of chords created by adding notes beyond the seventh. These chords are built on the dominant seventh chord and add the notes in stacks of thirds. It is possible to have a minor nine simply by using a minor third instead of the major one (in the case of C, above, that would be changing the e to an e♭). If you specify 'major nine,' that means that the minor seventh is raised one-half step to a major seventh (b♭ to b in this case—since the default for the third is already major). The other expanded chords work the same way, except that each builds on the one before so that in their full expression they get larger and larger. Each one, as you can see, moves the new added note up a third. We do not go beyond 13 simply because a third above that would take us back to the octave. At that point you are just doubling notes, which you are welcome to do anyway without altering the chord analysis. In real life, you rarely use all these notes, but there are some rules you need to keep in mind when considering which ones to drop. You need the tonic, the third, the seventh, and whatever is the highest note in the series (although it does not need to be voiced in the highest place). The others you add as you have room, and depending on which sound you want. The fifth is usually the first to go simply because it is so strongly implied by the tonic already. Listen to the 13 chords in the illustration to immediately above. Note how little the sound seems to change as notes are dropped out. It starts to sound a little thinner, particular on the last chord, but the general chord impression remains the same. As with other chords these can all be inverted in various ways, although having a bass note drawn from notes above the seventh is moderately unusual. It is also worth noting that in common tonal music, these chords are usually only used as expansions of the dominant chord, and in places where that chord would normally appear. In jazz and blues that rule is out the window. Not all the following chords are useful, depending on your tolerance for dissonance. I have not been as expansive on the details with the extended chords, but you should have the idea by the time you get there. Notice that I used ♯4 to add the tritone to a triad. ♭5, is enharmonically equivalent, of course, but if I 'add' a note that is already in the triad, what I am really doing is modifying the one that is already there. Actually X♭5 is not a bad sounding chord, although it is basically a X° (try playing C♭5 and then C° to hear this. Next play an E. Jazzers like to add the dominant 7 to it (X7(♭5)). Olivia Newton-John used one of these in Magic. If the audio button is screwed up, in the following table, click on the score fragment for the MIDI! As with regular triads, you can train your ear to hear at least some chord expansions. Dominant sevenths have a very recognizable sound, as do ninths. Above that things get a little mushy. Major sevenths and minor sevenths are also fairly easy to learn to hear, and half and doubly diminished sevenths are pretty recognizably different. The other add-ons do not present much difficulty either. Popular music is packed with these things, although not so much the ninths and above; they, however, are all over the place in blues. Play the chords yourself and get familiar with their sound. Write a song or two using a few you have never used before. If you haven't done so already, now would be a good time to look at alternate notations. Otherwise, we will be moving on with melodic movement in the next section. See you there.